Heheheh, in this font, it looks like the title is “Hello Kitty and Meowing.” It’s “Meaning,” and we all know Kitty doesn’t meow because she’s not a cat. Right? Right? 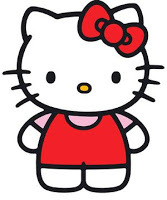 This week’s podcast is about Sanrio’s recent comments that Hello Kitty is not actually a cat. An awesomely in-depth article from Thinkprogress.org (BTW, Scott McCloud’s “Understanding Comics” is a must-read for anyone who’s into comics, movies, or basically any kind of visual arts or any culture at all, OMG, go read it right now). Dammit, Jim! I’m a cartoon character, not a cat! Posted on September 9, 2014 by Tamara	• This entry was posted in Art, Language and tagged art, branding, hello kitty, images, sanrio, semiology, semiotics, sign, visual. Bookmark the permalink.